xviii+454 p., cloth, 1030 g.
The study concerns passive voice in Earlier Egyptian (Old and Middle Egyptian combined), providing a text-based description of the relevant forms and constructions, and of their functions in discourse. It is argued that the passive is not merely a symmetrical pendant to the active, but a complex domain of its own, morphologically, semantically, and in terms of its discourse functions. This is manifest for example in the morphological types of inflectional passives, the productivity of subjectless passive constructions of various sorts, or the interaction of the passive with stative/resultative voice. Passive voice further interacts with aspect: in the unaccomplished, the passive has fewer forms than the active, while in the accomplished a reverse situation is observed. The two inflectional passives in the accomplished—the perfective V-passive (the ‘[TL: encoding=lingaeg]sDm(w)=f[:TL]’) and the T-passive of the [TL: encoding=lingaeg]sDm.n=f[:TL] (the [TL: encoding=lingaeg]sDm.n.t=f[:TL])—are thus shown to contrast with one another in principled semantic, not syntactic, ways. 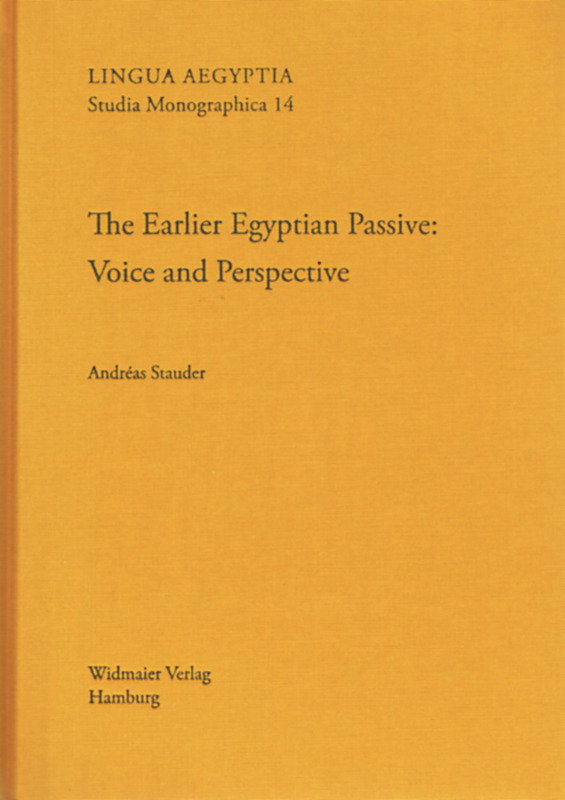 Major changes affecting passive voice during the history of Earlier Egyptian are discussed: the loss of the prospective V-passive, the spread of T-passives over the perfective V-passive in various environments, and the rise of an ‘impersonal’ subject pronoun [TL: encoding=lingaeg].tw[:TL] out of an inflectional passive marker. The last, a rare change and an instance of de-grammaticalization, is analyzed in details in terms of the processes involved and of the particular intra-linguistic situation that made it possible. Broadening the perspective, relevant elements of the Semitic background are evoked.